AcroYoga Retreat in Hiiumaa - LEVEL UP! The 2nd Hiiumaa AcroYoga Retreat is scheduled from May 26th to June 1st 2019! This Level UP retreat targets intermediate/advanced acroyogis who are up for a serious challenge. The venue is the beautiful Hõbekala Guesthouse in the midst of the magical Nordic nature of the island of Hiiumaa (Estonia). The programme is intensive and it consists of 5 full days starting with 90 minutes of morning yoga with Max, followed by solar and lunar AcroYoga and Thai massage with Afia Joy and Kadri. In addition to the physical challenge, Kadri and Max are eager to share with you the beauty and peace of the island they call home. You can experience the white nights walking and meditating on the beaches of the Baltic sea… Hike through the mysterious wilderness of a forest where every tree hides a view no one else has seen. In this magical atmosphere, the yoga and AcroYoga practices will set you on your way to reconnect with your true self, the people around you, the Universe. There are no distractions, no background noise, just nature and the people around you. We aim at creating a space where everyone can find who they are, be as they are, and feel the support of the community. Our training space is just as beautiful as the surrounding nature. It has very high ceilings, big windows and lots of natural light. And 50m2 of puzzle mats. All meals are prepared on site by Kätlin and Siim, Hõbekala Guesthouse owners. We offer accommodation in triple rooms, each one equipped with a private bathroom/shower. Single and double rooms and one big family room are available upon request (get in touch for pricing and conditions). 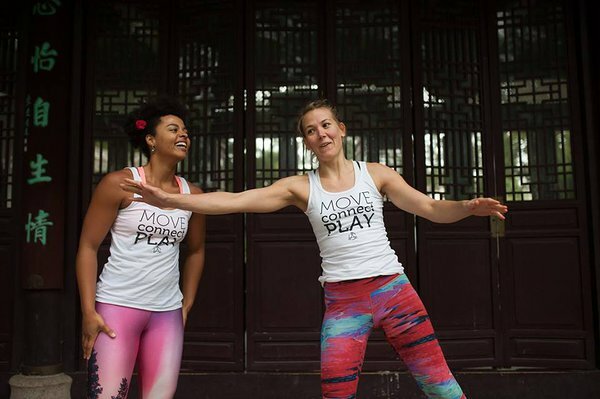 Born and raised in Germany, current AcroYoga teacher, bodyworker, and future osteopath, Afia Joy also has a rich past as a linguistic anthropologist. She has traveled the world from Tibet to Bolivia, from Ghana to Uzbekistan, and from China to Argentina. 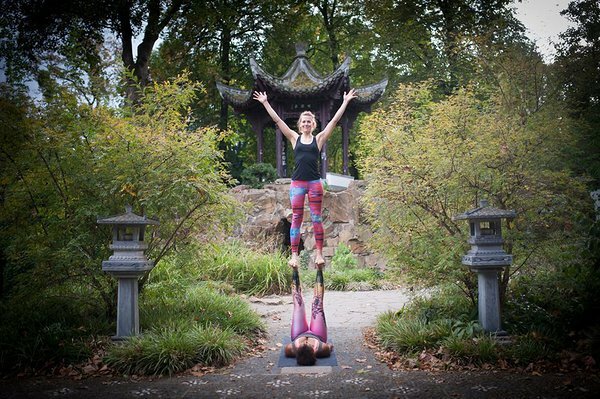 Through it all, she encountered AcroYoga as a universal language. "AcroYoga truly offers the magic of bringing people from all kinds of backgrounds together in a the first moments of practicing." Afia Joy Adu-Sanyah is an AcroYoga International certified Level II Teacher currently based near Frankfurt. Kadri is an Estonian freelance conference interpreter who found AcroYoga to be the perfect addition to her language combination. AcroYoga is about communication, as is interpreting. It is a place where one plus one is much more than two. If we are to combine two (or more) people each with their skills, strength, will and playfulness, we never know which new heights or depth we might end up reaching. Having a background in contemporary dance, pilates and acrobatics, Kadri finds AcroYoga hard to beat in its diversity. Kadri is an AcroYoga International certified Level I Teacher currently residing on the island of Hiiumaa (Estonia) with her husband Max and their son Maxwell-Maru. Max' career started in the mid-80s as an instructor of electronics and telecommunications in his native Italy. He moved on to become a researcher in thermo-fluids-propulsion and diagnostics systems in the field of high-energy physics at McGill University in Montreal. As an engineer Max worked at AgustaWestland in Italy and Bell Helicopter in Texas before moving to Cologne to become an officer of the European Aviation Safety Agency. Max is a 500h YTT certified yoga teacher.